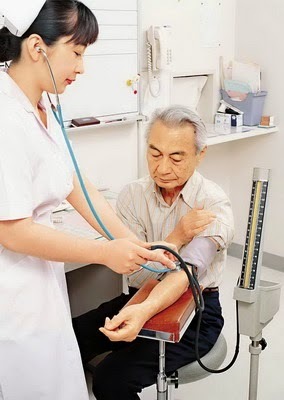 Treatment of high blood pressure in China is quite backward because it is exactly that - treatment of just the raised blood pressure, with no attention to other cardiovascular risk factors. Cardiologists now emphasise that it is essential to treat a person's overall cardiovascular risk, not just focus on single risk factors such as blood pressure. But a study carried out in 274 hypertensive patients in Zhejiang found that found that 28% were still smoking, 39% drank regularly and only 21% exercised frequently. The average salt intake per day was above the national recommended level of 6g. The study also found that most patients were taking only one drug for high blood pressure, which was inadequate to control their blood pressure. Many were taking 'herbal' medicines that actually contained out of date and dangerous western antihypertensives such as reserpine. As the authors conclude: "The study revealed outdated and inadequate treatment and health education for hypertensive patients, especially for those who have high risk scores for CVD. There is a need to review the community-based guidelines for hypertension management." In Shenzhen, researchers at the Children's Hospital have shown that invasive group B streptococcal infection is an important pathogen in infants under 90 days old, resulting in in high mortality and neurological sequelae. The streptococcal infection strains showed strong resistance to clindamycin and erythromycin. Liver disease is an expensive condition that often sees families facing ruinous medical bills in China. A study carried out at a Kunming hospital found that the average yearly cost of medical treatment for hepatitis B was 19,496 RMB, while patients with cirrhosis faced bills of up to 46,061 RMB. While public medical insurance helped pay for some of the costs, catastrophic health expenditure occurred for families affected by all these illnesses. China's high rate of caesarean sections will be difficult to bring down to more healthy levels, according to researchers. In a survey of a112,138 women they found the cesarean delivery rate was 55% and as high as 66% in some regions. Two thirds of the cesarean deliveries were scheduled and performed before labour and about 40%% were performed without any recognised medical indications. About 57% of the caesareans were done on request of the mother. Meanwhile, the progress of health reform is obviously too slow for the Premier Li Keqiang. This month he has called for more medical reform measures to overcome 'difficulties' in the healthcare system. In written instructions he identified problems areas that needed attention, such as hospitals should be prevented from being "financed by drug sales" He also said that more effort should be given to reform of county-level hospitals and more serious diseases needed to be covered by medical insurance. His orders came after reform measures were introduced across all county-level hospitals and are now being piloted in 100 city-level hospitals. Sorry for being Anonymous, but I would rather keep it this way on internet. I am a citizen of HongKong, and have read your comment on Hong Kong medical system years ago. Mr.Woodland, assume that you see this, do you feel that should China copy part of HK's system. By copy, I mean on subsidize usage of cost effective drug in public branches, approved by government body.